ATLANTA, April 1, 2019 /PRNewswire/ — Multiple EMMY®-winning TV/film producer, social media influencer, entrepreneur, and branding guru Rushion McDonald, hosts a powerful month of inspirational conversations on his hit show “Money Making Conversations,” with a range of influential stars, business, entertainment, and lifestyle experts this April. Sparking creative renewal with insights on building career longevity, business ownership and branding how-tos, financial education, healthy living and pathways to success, Rushion McDonald’s “Money Making Conversations” this April will include beloved award-winning actors, athletes, authors, media and social influencers, and more. “Money Making Conversations” is hosted by Rushion McDonald and produced through his multimedia company 3815 Media. “Money Making Conversations” can be heard live every Monday on Atlanta’s biz1190-AM from 10AM-Noon ET, with a replay every Friday 10AM-Noon ET, and every Sunday at 3PM ET. The show can be heard on SiriusXM Channel 141 on Howard University’s Campus and SiriusXM Channel 142 on HBCU Campuses, and episodes can also be accessed on iTunes, iHeartRadio podcast, Alexa, Google Play, Stitcher, SoundCloud, and seen live on Rushion McDonald’s Facebook page. 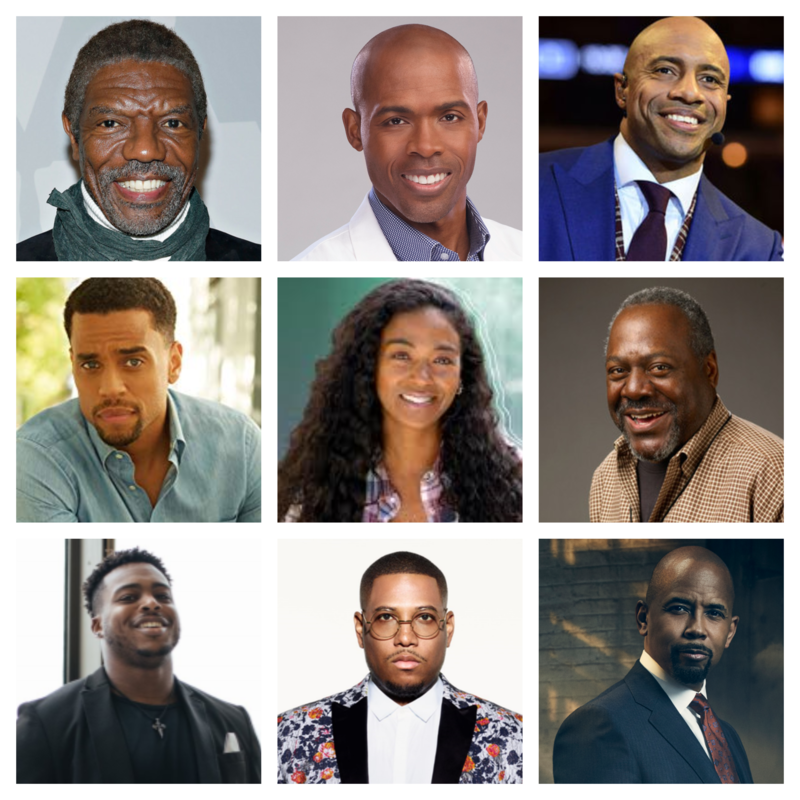 The “Money Making Conversations” guest lineup* expected in April includes: Award-winning Actor Michael Ealy (new movie: The Intruder); EMMY®-nominated Actor, Director, and Screenwriter Vondie Curtis-Hall (ABC “For The People”); Award-winning Actor, Screenwriter, and Author Michael Boatman(CBS All Access “The Good Fight”); Award-winning Actor Frankie Faison (NBC “The Village”); Dr. Ian Smith, #1 New York Times Best-selling Author, Physician, and TV Personality (new book: Clean & Lean: 30 Days, 30 Foods, A New You! ); Ananda Lewis, Host of TLC’s “While You Were Out,” Award-winning Broadcaster, and Carpenter; NFL Pro Brandon Copeland (New York Jets), Real-Estate Entrepreneur, Investor, and UPenn Financial Literacy Professor; Mikel Welch, Designer on TLC’s “Trading Spaces,” Interior Design and Lifestyle Expert; TV Host, Pop Culture Expert, and Media Personality Jawn Murray; Rochelle Brown andSonia Armstead, Co-Owners of Powerhouse Productions and Executive Producers (CLEO TV’s “Just Eats with Chef JJ,” “New Soul Kitchen”); Guordan Banks, GRAMMY®-winning Recording Artist, Songwriter, Food and Fashion Entrepreneur; Jay Williams, ESPN Host and former NBA player; Renowned Music Industry Executive Jonathan Azu, Founder of artist management company Culture Collective; Chef Keith Lorren, TV personality, Founder of Keith Lorren Spice King Gourmet Seasonings; Chrishon Lampley, Owner/Vintner of Love Cork Screw wines and lifestyle brand; Eunique Jones Gibson, Content Producer, Social Influencer, Activist, Creator of “Because of Them We Can” brand and educational subscription box for kids; Eddie Ghabour, Wealth Advisor, Co-Founder of Key Advisors LLC, Financial media personality and Author (new book: The Common-Sense Bull: The Keys to the Good Life Before and During Retirement); Sheila Marmon, Founder & CEO of interactive media and advertising company Mirror Digital, former corporate executive (Essence, Time Warner, Morgan Stanley); Tisha Holman, Digital marketing, branding and social media strategist, Founder & CEO of Mind Your Business, LLC, Author (books: The Social Media Makeover: 2nd Edition, and Go Ye Into All the World Wide Web); and Entrepreneurs Nicaila Okome (Host of Side Hustle Pro podcast, Founder of podcasting and marketing agency Side Hustle Pro, LLC, former corporate marketing for Google, MTV Networks, NPR) and Muoyo Okome(App Designer/Founder of App Magic, including creating mobile game apps that have garnered over 12 Million downloads, Host of Game of Grow podcast, former IBM software engineer, and Microsoft business manager). A renowned deal-maker, branding visionary, and enterprising business leader, Rushion McDonald’s experience includes personal management, writing, producing, working in television, film, and live entertainment, global public companies, and more. He has executed multi-million dollar deals, written and produced for Kevin Hart, Taraji P. Henson, Gabrielle Union, Jamie Foxx, and most notably he is the architect of Steve Harvey’s multi-media entertainment career. The multiple EMMY® and NAACP Image Award winner heads his own company, 3815 Media, and continues to produce original content, be an advocate for entrepreneurship through “Money Making Conversations” and social platforms.